Back in the early 1980’s this writer would go to the Montgomery County Boy’s Club in Eagleville, PA, ran by Steve Traitz (also head of the Local 30 Roofers) and watch the then heavyweight champion Pinklon “Pink” Thomas spar with “Big” Joe Thomas, one of the Traitz fighters and a former National Golden Gloves Champion. I can still remember Traitz taking off his “Jeff cap” and putting it on the head of Thomas before he left the gym on a cold winter night. Thomas, 43-7-1 (34), was one of the hardest hitting heavyweights in the modern history of the game. He was born in Pontiac, MI, and over time settled in Orlando, FL, in December of 1989 where he met his wife to be. He only had three amateur fights yet worked his way to the top of the heavyweight division. He was trained by Hall of Famer Angelo Dundee who once said of Thomas that he had a jab that was “as close to a Sonny Liston Jab as I have ever seen.” If you remember Liston could knock you out or your teeth out with his jab. Thomas was unbeaten in his first twenty fights which included stopping contender James “Quick” Tillis, 22-1, and in his next fight a 10 round draw with the No. 1 contender South Africa’s Gerrie “The Boksburg Bomber” Coetzee, 28-3, in Atlantic City in January of 1983. In Coetzee’s next fight he won the WBA World heavyweight championship knocking out Michael “Dynamite” Dokes. In his first defense which could have been rightfully against Thomas he chose to fight Greg Page losing his title by knockout in a controversial 4 minute round. Thomas would go onto win his next four fights, three by stoppage, including over Alfonzo Ratliff, 16-1, and Michael Greer, 17-3-2. This earned him a world title fight with Philly’s “Terrible” Tim Witherspoon, 18-1, for his WBC World heavyweight title at the Riviera Hotel & Casino in Las Vegas, NV, on August 31st, 1984, winning by majority decision. In his first defense Thomas stopped former WBA champion Mike “Hercules” Weaver, 27-10-1, in the eighth round. In his second defense he was upset by Jamaican Trevor Berbick, 30-4-1, at the same Casino by scores of 115-114 and 115-113 twice to tell you how close it was. Berbick would go onto be the last opponent to defeat Muhammad Ali ending the latter’s career. Thomas would go onto fight the likes of “Iron” Mike Tyson, Evander “The Real Deal” Holyfield, Riddick Bowe and Tommy Morrison among others. In his next to last fight he defeated Craig Payne a former National Golden Gloves champion who in the amateurs defeated Mike Tyson and Cuba’s 3-time Olympic Gold Medalist Teofilo Stevenson. In this win over Payne, Thomas won the International Boxing Organization and the vacant World Boxing Federation titles. In his final career ending bout Thomas lost to Lawrence “Poncho” Carter, 21-5 (18), at Columbia, SC. Thomas founded Project P.I.N.K. (Pride in Neighborhood Kids) as an outlet to foster youth mentorship. He was inducted into the Florida Boxing Hall of Fame in 2009 after settling in Orlando, FL. Thomas was graceful enough to answer questions for this Boxing Insider article. BOXING INSIDER: I want to thank you for taking the time…. PINKLON THOMAS: I would like to thank you for writing this article and following my career so closely as this really means a lot. BOXING INSIDER: What are you doing today? PINKLON THOMAS: February 10, 2019 will be 30 years in my recovery from substance abuse and alcohol. Today through Project P.I.N.K. I still mentor kids and young adults. Something I use to say “After they’ve seen the rest, send them to the best and I’ll break them like a horse”. I have a passion for mentoring others. Keeping them from committing crimes, or getting killed or sentenced to life in prison. I teach them there are alternatives. BOXING INSIDER: Tell me about your book. PINKLON THOMAS: I’ve written a book “Back from The Edge of Hell” as told to John Greenberg. This is an autobiography and book which is currently on Amazon, and ebooks, through Digital One Media, Barnes & Nobles and many other sources. I’m heavily affiliated with an organization called World Sports Alumni (WSA) an Alumni that work with former athletes and help charitable organizations in various capacities. The CEO Charlie Williams is also a professional athlete and former Billiards Champion. BOXING INSIDER: I understand you’ve had some major health challenges? PINKLON THOMAS: Over the years Boxing took a toll on my body. I’ve had two major knee replacements, two detached retinas, Hepatitis C, in which Harvoni and prayers saved me! Cancer of which Dr. Vitpul Patel of Celebration Health, introduced me to the importance of Robotic surgery. Recently, late 2017 I had major surgery on nearly 75% of my spine by Neurosurgeon Dr. Paul Sawin, of Winter Park, Florida, who literally saved me from becoming permanently confined to a wheelchair and an extensive amount of Physical Therapy that is ongoing. Due to several health issues and because of having chronic pain, as a result for relief I used prescription opioids around the clock. A buddy of mine Loui Delgado, and the help of Serenity Springs, today I’m opioid free. BOXING INSIDER: During your career was there anyone that had a great impact in your life, with the exception of your parents? PINKLON THOMAS: Certain people I would like to recognize, that played a major part in my career such as: Roland Jenkleson, without him I may have not had a career. Jack Stafford who told me that whenever I found myself in trouble to use my left jab. This inevitable became my trademark! George Benton, who taught me the Philadelphia style on how to fight inside, which brought out my power. He put me with two of the greatest trainer mentors, Tommy Hawkins and Willard Barber. They prepared me for the championship until three weeks before going to Vegas to hook up with Angelo Dundee. When I untied with George Benton, we would train before going to Vegas to hook up with Angelo Dundee. When I united with George Benton, we would train at Joe Frazier’s gym and there I learned the skills of how to fight inside. Through Joe and his family, great former champions, as well as contenders, I rose to championship status. BOXING INSIDER: Tell me briefly about your family? PINKON THOMAS: Today, I reside in Orlando, Florida with my beautiful wife DaJuana (DJ) Thomas of over thirty years, of whom is my everything! Together we’ve reared two beautiful daughters Pierra and Peyton, ages 26 and 32. We have imbedded in them the importance of keeping God first, obtaining an education, and having respect for others. We also have another older daughter PaQuana, who resides in Michigan and I have a son Pinklon Thomas III, who lives in Chicago with his wife Patrice. We also have five amazing grandchildren! BOXING INSIDER: How did you come up with a plan to secure your future? Many professional boxers are bankrupt of destitute after their career by not managing their money or having bad CPA’s. PINKLON THOMAS: We had a plan. During my comeback to obtain my second heavyweight championship for the IBO, I felt that it would be wise and beneficial to have DaJuana pursue her education by obtaining her Bachelors degree so that one day she could provide when I was no longer able. Together we made a lot of sacrifices, and by investing into annuities early on. Inevitably the continued school and completed her MBA and currently works in Human Resources. I’m grateful today for God’s strength, mercy and blessings! BOXING INSIDER: It was great making contact with you again this week. It’s been years since I last saw you at Steve Traitz Gym working with “Big” Joe Thomas. How’d Steve treat you? PINKLON THOMAS: Steve treated me great. He paid me $ 50 round to spar with Joe Thomas. He was a real stand up dude and very humble. BOXING INSIDER: If you had to pinpoint one thing in how in the world with only three amateur fights turning pro at 20 achieve the heavyweight crown after 20 fights? PINKLON THOMAS: I didn’t have a manager and signed a promotion contract with Don King and asked Angelo Dundee to train me for the title fight. Don told me he had all the heavyweights. BOXING INSIDER: Your first non-win was a draw with future world champion Gerrie Coetzee who had the “The Bionic Hand” which was his right that was fused together after some 23 surgeries. What kind of a puncher was he? PINKLON THOMAS: He was a hell of a puncher. BOXING INSIDER: What were your feelings after defeating Philly’s “Terrible” Tim Witherspoon for his WBC title? PINKLON THOMAS: That was the greatest accomplishment in my life. I was on cloud 9. 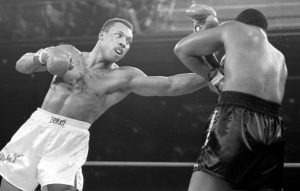 BOXING INSIDER: In your first defense you scored a pair of knockdowns over former WBA champion Mike “Hercules” Weaver, stopping him in 8 rounds. What kind of a fight did he put up with you? PINKON THOMAS: That was a good fight. I had gotten good boxing prior to this. BOXING INSIDER: You lost for the first time in your career to Trevor Berbick by the closest of margins of one point and two point’s each on the judge’s cards. Instead of giving you a well-deserved rematch he chose to defend against an opponent named Mike Tyson and we all know how that turned out. Was there ever any talk of a rematch with Berbick after losing your title to him? PINKON THOMAS: No, King wanted Mike Tyson to fight him. BOXING INSIDER: What was your toughest fight? PINKLON THOMAS: Probably the Berbick fight. I was stressed out and not prepared like I would have liked to be. BOXING INSIDER: In 2009 you were inducted into the Florida Hall of Fame having resided in Orlando. How enjoyable was that? DJ THOMAS: He and Angelo Dundee went in together. BOXING INSIDER: I want to thank you for taking the time to answer these questions for Boxing Insider and for always being a very approachable person back in the day.